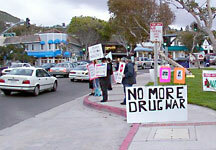 Mexico has provided the United States with a drug-supply market for many years. With a significant amount of Colombian trafficking now moving to Mexican dealers, a real concern is growing in the Southwest about the "Colombianization of Mexico." The elimination of many Colombian organizations has allowed Mexican dealers to gain influence in the industry, dictating terms with their Colombian providers and taking over distribution in many U.S. regions. About 70 percent of the cocaine market flows through the shared 3,200-kilometer border with the U.S., multiplying by the mile the potential for corruption and violence. Murders, kidnappings, theft and assault are more frequent in recent years; so much that both sides of the border have support groups for victims of "druglord crimes." Just as in the U.S. and perhaps more, drug corruption reaches the highest branches of Mexican government. It has grown such deep roots that political imbalances resulting from the elimination of that corruption can have effects in Washington D.C. Mutual agreement about drug policy matters is still secondary in Mexico and U.S. relations, mostly dominated by immigration and commerce issues. Most Mexicans and many U.S. citizens contend from experience that U.S. customs agents are also "on the take" and permit some vehicles to cruise through border inspection stations in exchange for money. If relatively well-paid U.S. agents aren't immune to the seduction of easy money, how can we expect ordinary citizens to be immune? If you have ever visited the U.S./Mexico border area, you would remember the long wait at the entry point coming back into the country. In order to eliminate these epic waits, businessmen from both sides of the border fought for and won a "fast lane" for U.S. and Mexican citizens who are "pre-cleared" by U.S. law enforcement agencies. How easy will it be for traffickers to use that "fast lane" for illegal drug shipments? Historically, border natives have been a law unto themselves. Such lawlessness developed from both countries struggling over the border for being neither American nor Mexican enough. Alienation and resentment grows as border security employs police-state tactics. Intensified interdiction efforts along the border in the name of security are fragmenting the people even more, keeping them too frightened to speak out against intrusions of privacy. The Mexican Highway Department randomly stops vehicles to check documentation. El Paso police followed suit by initiating a 'zero tolerance operation' establishing traffic checkpoints throughout the city to ensure "proper documentation." In both departments the officers have expanded their checks to include searches of the vehicles. Currently, the El Paso City Council is discussing a program called TIP - Targeting Intoxicated Patrons - that allows police officers to enter local bars to make arrests for public intoxication based only on their individual judgements. These measures are intended to be preventive, but are they only preventing individual rights and freedom? The Juárez­El Paso population of 2 million makes up the largest border community anywhere in the world, expanding more than 5 percent a year. Juárez is now Mexico's fourth largest city with a population of 1.3 million and 50,000 more arriving each year. Two countries with very different economic, civic and cultural rules govern this single metropolis. This is where the 1st world meets the 3rd world. These people breathe the same air, drink the same water and share the same destiny. By next year, Hispanics will be the dominant ethnic growth in the U.S. with at least 15 additional House districts. Every state slated for a new seat in Congress has a growing Hispanic population to thank for it. Hispanics have become the largest, so-called minority group in the U.S. Isn't it time now for all minority groups to flex their muscles in unity through the power of the vote? Run for office. Repeal laws against our freedoms. 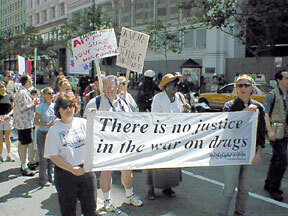 End this unjust drug war. Stand up and be heard. On July 5 the San Francisco Chapter of the November Coalition met near the Federal Building at the corner of Polk and Golden Gate in San Francisco to pass out copies of the Bill of Rights to federal workers and other citizens returning from work after the July 4 holiday. Some folks dressed in colonial costumes for eye-catching appeal. Vigilers met in the morning for a couple hours at this busy corner. On the flip side of the Bill of Rights document was a statement about how the Drug War has affected and diminished Constitutional authority along with a few things we can do to stop it and why. 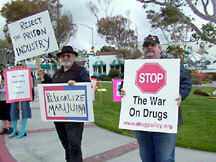 By standing up at the Federal building we went to the heart of the Drug War. While we may change few federal minds, and other closed ones as well, we will take back the spirit of the Bill of Rights. It is the high ground, and we should use and cherish it as our heritage and a sound basis for all people's freedom. Never doubt that division among people cripples and kills unity of purpose. Young and old, good and bad, black and white, our intent is still to overcome power. 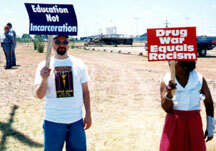 Within TNC our first mission has been to humanize all victims of the drug war. We're still working on that. Who can deny that "the propagandist's purpose is to make one set of people forget that certain other sets of people are human?" as author Aldous Huxley insisted. Two buses of Tulia Freedom Riders left Austin at midnight on July 21 heading for Tulia, Texas and the Never Again Rally. On the way, the 65 Freedom Riders stopped at the Wheeler Substance Abuse Felony Punishment Facility and the adjacent Formby State Jail to hold a vigil. One of the men captured in the Tulia drug sting is currently in this prison. Together these units confine about 1,500 men. The State Jails in Texas were designed to incarcerate substance abuse offenders but also hold transfer prisoners. The majority at Formby is non-violent, African-Americans held behind fence and razor wire outside the small town of Plainview, Texas, a flat, dry, and very hot place in the summer. Joined by local supporters, we numbered about 70 strong, standing with signs, which read, Educate Don't Incarcerate and The Drug War Equals Racism. We spread out along the highway and around the corner leading into the units. Twenty or so prison guards came out and formed a front behind us to make sure we stayed on the road and not come any closer to the facilities. One filmed us and the others were silent, refusing to take any November Coalition tabloids offered. In short, they were very uptight about this whole scene and didn't quite know how to deal with us. A couple of us managed to hand out November Coalition four-page tabloids and Texas Inmate Family newsletters to people arriving in their cars to visit imprisoned loved ones. These interactions were for me the most satisfying because we could give needed information and resources that may encourage them to stand up and fight for their loved one, motivated by our determined solidarity. An AP reporter and at least one local affiliate of one of the big three major networks covered our vigil. Dan Forbes, of Salon.com, and recent recipient of the Edward M. Brecher Award for Achievement in the Field of Journalism, completed the first leg of the Freedom Ride and was present at the vigil as well. Numerous stories and pictures have now been displayed in newspapers across Texas, and the vigil was an important part of all the reports. Let's keep this momentum alive! Libertarians in Los Angeles and San Francisco held simultaneous twin vigils on Saturday, June 16, to honor victims of the long running but failed War on Drugs. The gathering in Los Angeles met at the federal building while San Francisco vigilers held forth at Powell and Market Streets. 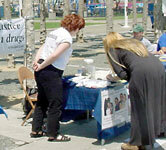 The Political Prisoners Support Committee of the Libertarian Party of California organized the twin vigils. 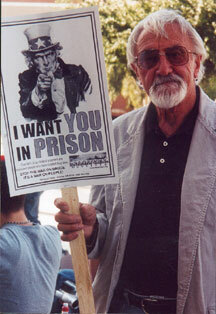 "The War on Drugs is nothing more than a political war, and the victims of this war - whether dead or alive - must never be forgotten," said Hal Chiprin, chairman of the Political Prisoners Support Committee. "This includes everyone from non-violent drug users who have been incarcerated, to medical marijuana patients who continue living in fear of persecution, to innocent civilians and law enforcement who have been caught in the crossfire of the Drug War." "We invite anyone whose life has been touched by this insane war to join us in commemorating these victims," Chiprin said. Participants at the Los Angeles vigil marched down Wilshire Blvd. to the Westwood Memorial Gardens where the ashes of best-selling author Peter McWilliams are interred. McWilliams, an outspoken Libertarian and medical marijuana activist, died one year ago on June 14, 2000 after a long battle with AIDS and non-Hodgkins lymphoma. At the time of his death, McWilliams was awaiting sentencing on federal marijuana charges. The judge in the case had prohibited McWilliams from taking the medical marijuana that allowed McWilliams to withstand the effects of his AIDS and lymphoma medications. 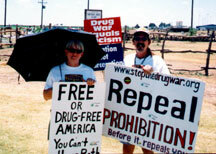 "Peter McWilliams was a hero to all victims of the Drug War. It is only fitting that we pay our respects to someone who died for what he believed," noted Chiprin in his press release before the vigils. Nearly 100 people gathered in Los Angeles, according to Chiprin. He also thanked Patty and Owlswan for assembling vigilers in San Francisco. 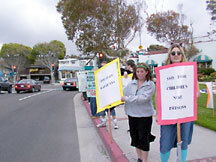 The twin vigils involved cooperation with California members of November Coalition and the Libertarian Party's voter education efforts.